An objective approach to assessing your personnel. Cesim offers a uniquely objective approach to assessing the business and financial acumen of personnel. The scoring method is based on the evaluation of your staff's performance as they run virtual companies operating in an environment that emulates business situations that evolve in the real world. Our web-based business simulation are accessible 24/7, secure and easy to access and use. No administrative work is required by the client. All the participant needs is a device with an internet connection and a web-browser. Cesim takes care of the rest. Participants (as many as 100 simultaneous users) manage the simulated companies over several rounds, representing virtual years. 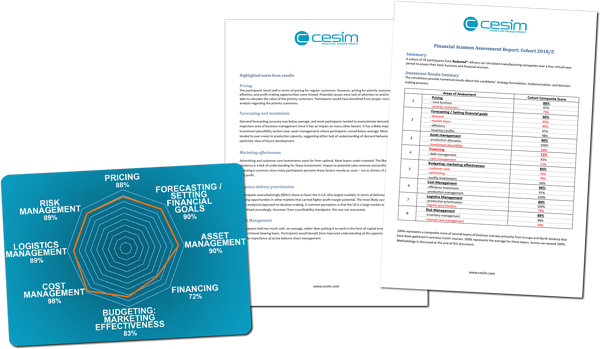 For each round, the Cesim platform compares the decisions and forecasts made by the participants against the optimal decisions in that particular situation and eventually scores the participants' business acumen along different dimensions. The resulting scorecards are produced for each individual participant and/or as an aggregate for the whole group. Participants operate a simulated company through an easy-to-use browser based interface. They run their business over several virtual years – but only hours in the real world. The simulation integrates a range of concepts from various management related disciplines, including marketing, production, logistics, and finance. After participants complete the simulation, scorecards and benchmark results are generated by Cesim.